How Do You Solve a Problem Like Tobago (pt 1)? 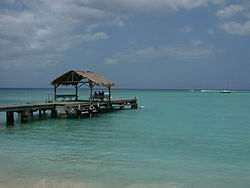 Thing is, Tobago, for all its beautiful beaches, environmental lushness and pleasant people is a complex place. Tobago, for far more centuries than Trinidad, enjoyed self-government. And the subsequent warding to Trinidad changed the island's political status and identity in crucial and fundamental ways. Tobagonians have long since had a deep grievance towards Trinidad, because it is believed that many of the policies of the Central government, whether during British rule or in the post-Independence era, have underdeveloped the island more than it has helped it. Couple this grievance and remembered past of self-government, with the fact that Tobago has a separate and distinct culture and identity from Trinidad and you begin to see just how difficult the relationship between the two islands have been. And there are daily reminders of how little Trinidad actually cares for Tobago, unless it is to eat crab and dumpling on Store Bay, or snorkelling in Pigeon Point, and in recent times,buying up land as much as possible for holiday homes. There are national holidays for everything under the sun in this TWIN-ISLAND republic, but no holiday that celebrates the pairing of the islands. In 2008 when we celebrated 110 years of twinning, it went virtually unnoticed by the wider public. We speak of being Trini to the bone, of being Trinidadians, hardly ever do you hear people talking about being Trinbagonian. Look at Tidco's or TDC's thrust. Tobago's beaches are marketed and that's it. Very little is known about Tobago's culture and traditions, and very little attempt is made to properly incorporate it into the national identity. If you think curry crab and dumpling is authentic Tobagonian cuisine then you are a tourist! Talk to me when you find out what konkontay is....maybe. Of course, the point that I am trying to make is that Trinidadians are too ignorant about Tobago to have a position on Tobago....and in that light I think the PM is being nothing short of insulting to Tobago and Tobagonians to set up a committee to oversee the issue of Self-Government headed by Hamid Ghany, an open supporter of the current PP Government, along with Christlyn Moore, who has written briefs for the Attorney General's office, and Martin George, a man who it is alleged has done legal work for TOP Leader, Ashworth Jack. All that committee is going to do is rile up Tobagonians and tell Kamla what she wants to hear. That Committee should be dissolved, and one with Tobagonians with the island's interests at the forefront put in place. Unless that is done the issue of Tobago's political identity remains a century's old football and this Committee is nothing but a pappyshow! To help relieve the ignorance, I've put together a brief socio-historical overview of the Tobago issue. This is just the first part. I intend to come back and discuss the various arguments for and against self-government as put forward by the Government and the THA. Thoughout the 16th, 17th and 18th centuries Tobago, an island discovered by the Spanish in 1498, was fought over and colonised by British, Dutch, French and Latvian powers. The 17th and 18th century saw the island reach its economic peak as a sugar producing colony ruled over by a white plantocracy and serviced by enslaved African labour. By the nineteenth century however, the island’s economy was going into decline, and Britain, in whose hands Tobago finally settled, began considering new administrative options for the island. From 1763 to the mid 1800s Tobago had functioned under a bi-cameral legislature, and answerable only to its Governor. Given the general decline of the sugar colonies in the 19th century, moreso after the 1846 Sugar Duties Act, Britain began to implement changes for all of her colonies and smaller islands like Tobago often got the shorter end of the stick with these new policies. Says historian Learie Luke (2007), “In 1838, five years before the end of slavery, Tobago, Grenada and St. Vincent were placed under the authority of Barbados...This was done partly because the British wanted to reduce the administrative costs of the colonies.” In the post-emancipation period, political and administrative problems further compounded the island’s economic woes. In 1874 the Crown insisted on the Legislative Assembly amending the constitution and imposing an act which abolished the bi-cameral house system and set up a uni-cameral government called the Elected Legislative Council, composed of 14 members: six nominated by the governor and eight elected by a “very limited franchise of white colonists”. The Belmanna Riots of 1876, in which one rioter was fatally shot, the courthouse burned and Corporal Belmanna killed and dismembered, increased concerns about safety and the ability of the planter class to protect itself and its property. On June 6th of that year the island’s constitution changed and Tobago went from having a Legislative Assembly to being a Crown Colony. By 1878, a mere two years later, the island was having difficulties meeting its financial commitments and Augustus Frederic Gore, the island’s Lieutenant Governor, made the suggestion of pairing Tobago with Trinidad. Prior to Gore’s suggestion, in 1869 there had been a bit of a tussle over where Tobago should go between the governors of Barbados and Trinidad. Sir Arthur Gordon, of Trinidad, argued that Tobago should fall under the jurisdiction of Trinidad while the political elite of Tobago did not want the merger with Trinidad. On the other hand the political elite in Barbados and the Windward islands were also reluctant to be paired with Tobago. Each island wanted to retain as much autonomy as possible. Proximity and economy were the main concerns of Lt-Governor Gore when he said: “I am of the opinion that there is no necessity for maintaining the colony as a separate government. the distance from Trinidad to Tobago is only 18 miles from land to land, and if a good road were made from Port of Spain to Toco and a steam launch were employed, daily communications might be established between Port of Spain and Scarborough. The saving that would be effected by the move would be 3,775 pounds (Luke, 2007, 51-52)”. Gore planned to abolish the salaries of unecessary administrators. He foresaw Trinidad helping Tobago in diversifying its economy by shifting away from sugar and taking on cocoa, which had proven lucrative for planters on the larger island. By 1885 Tobago’s sugar economy had collapsed, after A.M. Gillespie and Co, the main finance company for Tobagonian planters, fell into bankruptcy. In March 1885 a British Order in Council created a sort of Windward Islands government by merging Tobago, Grenada, St. Vincent and St. Lucia. While planters were less than thrilled about the merger, it did not affect their separate administrations and identities. It was the 1889 merger with Trinidad that would affect the island’s political identity and autonomy as colony that was once self-governed. Between 1889 and 1899 the island was governed from Trinidad while retaining a financial board that had legislative powers limited only to local regulations. By 1899, the island lost all autonomy when it was made a ward of Trinidad. The ward system was introduced to Trinidad in 1849 by the Colonial Office as an implementation of some measure of local government to the island. Wards were administrative divisions of a county. The warden, a senior government official, was responsible for these districts. Road maintenance, health care, schools, and imposing rates and taxes to be used to develop their jurisdiction, were some of their main responsibilities. In March 1946 the ward system was replaced by the county council system. Between 1956 - 1976, under PNM leadership Tobago’s administrative system and infratructural development received special attention, while the island dependent on Trinidad's central government to do the major decision-making. In 1980 the island was granted internal self-government, a democratically elected Tobago House of Assembly was again established in December 1980. Please take into consideration that this is a brief overview. In subsequent posts, I'll go into more depth about Tobago's system of governance from 1956 - 2010.